can only wait and see what North Korea has up its sleeve. a "communication satellite" sitting on its launch pad. For almost a month, the reclusive country has been showing only a few of its cards to the world as it intends to -- in its words -- launch "an experimental communication satellite for peaceful purposes." However, while the North Koreans are showing just a few cards, as is typical for them, there are no expectations they will show their whole hand -- and many believe they are playing their own game. On March 12, North Korea tipped off the rest of the world that it would be launching a rocket when it filed a maritime warning notifying ships that parts of the Sea of Japan and Pacific Ocean could have falling debris from a launch in early April. 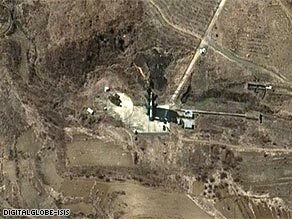 For weeks, commercial and military satellites have been flying over the Musudan-ri launch site in northeastern North Korea and watching the methodical preparations. The rocket was assembled mostly in a plant near the launch pad. Just this week the first satellite image surfaced showing the rocket on the launch pad, and now military sources said it appears the country is fueling the rocket in preparation for a launch. It is not entirely clear why North Korea is pushing this launch. In the past, preparations for, and threats of launches were cries for attention from Pyongyang, which would often lead to diplomatic talks. U.S. military and intelligence officials are unclear if there is a political message Pyongyang is trying to get across this time. In the words of one U.S. official, "You just never know what this guy wants," referring to North Korean leader Kim Jong Il. While North Korea said this launch is to put a communications satellite into orbit, the U.S. believes it is a cover story to test its ballistic missile technology. "It is not clear to us what the intentions are because [the rocket] is dual-use," Pentagon spokesman Geoff Morrell said. North Korea has been banned from such tests since a 2006 resolution by the U.N. Security Council in an attempt to rein in the country from testing long-range ballistic missiles that could one day carry nuclear weapons. While North Korea has a poor track record at successful long-range ballistic missile tests, U.S. intelligence officials have said Pyongyang is taking its time and making sure it's doing things right this time. A 1998 launch failed in later stages but did fly over Japan before landing in the Pacific. A 2006 launch of a Taepodong-2 blew up 30 to 40 seconds into the flight, ending up in the ocean off the coast of North Korea. The Taepodong-2 probably flew to a height of only 15 to 20 kilometers (9.3 to 12.4 miles) and about 10 to 15 kilometers (6.2 to 9.3 miles) from the range, according to a Jane's Intelligence Review analysis. Those launch preparations were harried, and intelligence officials believe that rushing the launches led to the failures. The rocket the North Koreans currently are preparing is also a Taepodong-2, which the U.S. said has the capability to hit Alaska and Hawaii if the technology can be perfected. "Since the first time that they launched the missile it flew for a few minutes before crashing, the range of the Taepodong-2 remains to be seen," said Defense Secretary Robert Gates last month. "So far, it's very short." The Taepodong-2 is not considered state of the art, but it has three stages, which means if it works properly it could be a threat to Alaska, Hawaii or Guam if a lighter payload of a biological or conventional weapon was aboard, according to experts. "With a full nuclear warhead on it, it would fall short of Alaska and then Hawaii or at least the more inhabited parts of Alaska," said David Mosher, a senior policy analyst at the Washington think tank Rand Corp. The U.S. has said North Korea does not possess a nuclear warhead or the required technology to miniaturize one to fit on its rockets, but it could put a "dirty bomb" or conventional weapon on one. That said, the expected launch of a satellite by the North Koreans as early as Saturday is expected to be just that -- a satellite launch, according to Gates. The U.S. and Japan are taking no chances, however, positioning ships in the Pacific and the Sea of Japan with the capability of tracking ballistic missiles as well as shooting them down if need be. But the Americans have said they have no intention of shooting it down unless there is a clear threat to the United States. While there are real-time concerns about the pending launch in Japan and Korea, U.S. officials are worried about what the launch could mean for the future of North Korea's missile program. The North Koreans could glean a good deal of useful data from a successful flight to improve the program. Even an unsuccessful launch can provide them with information that can move their program forward, Pentagon officials said. But at the Pentagon, officials quietly worry about a bigger problem with North Korea. How have international laws banning this country from building and firing such a weapon failed, and what teeth will a law have to prevent it from moving closer potentially to launching nuclear weapons at the U.S. or its allies? In the meantime, the U.S. continues to try to persuade the North Koreans from launching the rocket and deter them from continuing with that kind of activity, officials said.